Home Eco Friendly Guide	Are Bald eagles to be left open to the hazards of Development? Are Bald eagles to be left open to the hazards of Development? Bald eagles have made a majestic comeback from the edge of extinction under protection of the Endangered Species Act. However, developers now want to move into the areas that are their nesting sites. The process will become easier for them when they go off the endangered list. Their favorite tree, the white pine, is used for nest building, but unfortunately it has dwindled with over logging. Once a pair selects a nesting territory, they use it for the rest of their lives. If they have left the territory for better feeding grounds, they usually return to lay eggs. 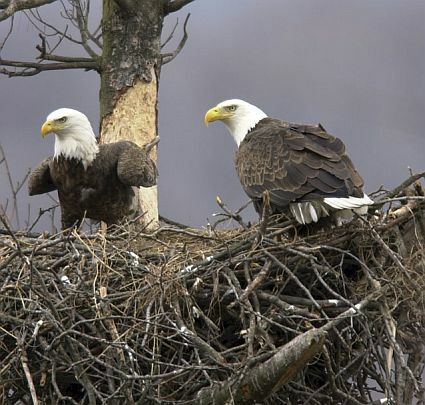 Bald eagles mate for life, returning to nest in the general area (within 250 miles) from which they fledged. The nest is reused and added to (decorated) each year, often becoming eight or more feet deep, six feet across, and weighing hundreds of pounds. The move to remove bald eagles from the endangered list stems from a lawsuit filed by a Minnesota landowner who found he could not develop his property because of a bald eagle’s nest there. They are now stuck in a tricky deliberation between property rights and species success. In the face of shortage of land due to growing populations, it makes it all the more difficult to find a development path compatible with preservation of ecosystems and biodiversity.